This is yet another cheap data plan coming from Airtel. Airtel is currently giving some subscribers a whooping 150% bonus on data. Ofcourse we all know Airtel with their eligibility issue. So this offer is not for everyone as it is Sim selective. 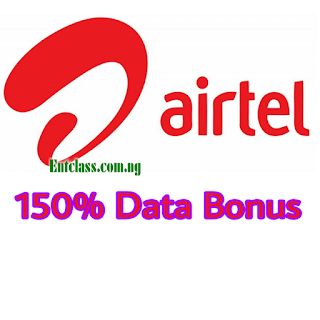 With Airtel 150% bonus data, you will be getting 1.8GB for N500 which is unlike the double data plan. Remember, you can also get 500MB for N200, 1.8GB for N500 and 3.75GB for N1000 with an additional 1GB on activation of the regular Android bundle of 750MB for N500 and extra 2.25GB on activation of Android bundle of 1.5GB for N1000 in this offer. Also remember that you can get 10 times bonus on calls and data on Airtel Smartrecharge. Now let's proceed to the topic of this post. Like I said earlier, this plan is not for everyone. It's for selected users on the Airtel network. However, if you didn't receive this message and wish to know if you are eligible or not, simply dial *418*2# with an empty balance and wait for the response. If you get a response saying Insufficient balance, then you can proceed to recharge your line with N500 and subscribe to the data. Data bonus validity is two weeks. To check your data balance, dial *140#. Were you eligible for this data plan? Kindly leave a comment below and share this post with friends. The plan is good but it should have been for all Airtel SIMs, if i were the chairman,i would have made it so to draw more customers. Not working as said ,was given just 750mb not 1.8gb .waste of money n time .